I adore the lovely colour combinations of the pretty Petal Garden Designer Series Paper Stack. They are so fresh and pretty which is why I decided to use them for some recent Thank You Packs. 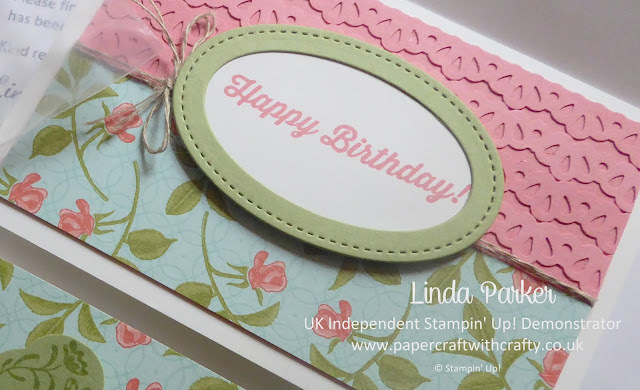 The little card base is a Whisper White note card which come in handy packs of 20 cards and envelopes. I bought the new Decorative Ribbon Border Punch and found that I was able to add some interesting texture to what was otherwise just going to remain a blank background panel. I think the Oval Stitched Shapes Framelits Dies make for a pretty centrepiece. I added some rustic looking Linen Thread to the completed card. The Label Me Pretty bundle came in very handy for the sweet covered notebook. It's really convenient to be able to stamp and simply punch out the pretty label. I am so pleased with how this colour co-ordinated little pack turned out. Hope the recipient likes it too ! Like a summer garden. Although it's not much like summer today! Very pretty Linda. These are completely unique and different cards from others. I've never seen such incredible work on cards before.never give up on your dreams.thank you very much for sharing it with us.keep posting. August Projects - A little bit of everything !